WE’VE ALL HAD IT INSTILLED FIRMLY IN OUR CONSCIOUSNESS that coral reefs are living organisms. But, faced with the colorful, solid structures that we see when we go underwater, what does that actually mean? Those rock-like surfaces aren’t living substances themselves, but hard facades of calcium carbonate – essentially, limestone. The living animals – tiny soft coral polyps with slender tentacles – are ensconced underneath, protected by the cup-shaped calcium-based corallites they’ve manufactured. Each one is only one to three millimeters in diameter, but they’re there by the hundreds, often thousands. The communities of living corals we see are also only a few millimeters thick top to bottom, a thin veneer atop a mass of lifeless corallites that have been laid down by their departed predecessors, sometimes to considerable depth. Or, it might be on some other, old coral that died and left a substrate for settlement. 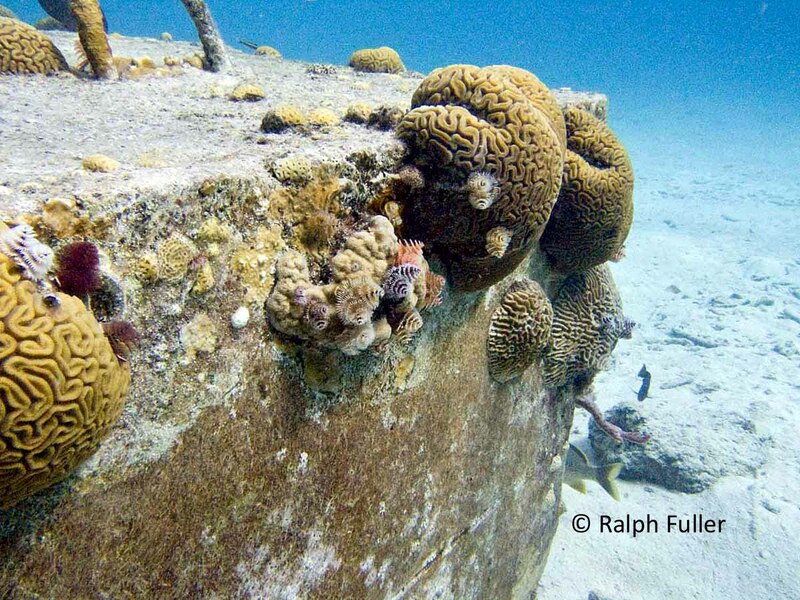 Corals, and reefs overall, are dynamic structures, continually being built up and torn down. The name cnidaria comes from the Greek word for “stinging,” which is what cnidarians do with structures on their tentacles called nematocysts. Sea jellies and fire coral stings might hurt you, but stony coral nematocysts are scaled for small prey, like plankton, and wouldn’t be a problem for you if you touched some. Which you should never, never do; it’s bad for them, for the planet, and therefore for us. A NOAA schematic for a stony coral polyp. Coral polyps do a lot with a fairly simply design. In terms of body shape, they’re symmetrically radial – a central body sac containing a mouth and gut, surrounded by tentacles to capture food. The food in question is mostly plankton grabbed from the passing soup of algae, eggs and other tiny stuff. Polyps are round and symmetrical horizontally but vertically they have an oral surface, where the mouth is, and an aboral surface on the other side. Essentially, they sit on their aboral sides and face upwards or outwards into the water column. The mouth is the opening to a coral polyp’s gastrovascular cavity – its stomach – in which food is digested. The mouth is its only opening; waste is expelled through the same channel. Since tentacles make good targets for larger fishes seeking easy meals, most corals extend their polyps into the current at night, keeping them withdrawn and protected during the day. Some corals heave their tentacles out throughout the day; apparently their stinging capacity is enough to deter predation. 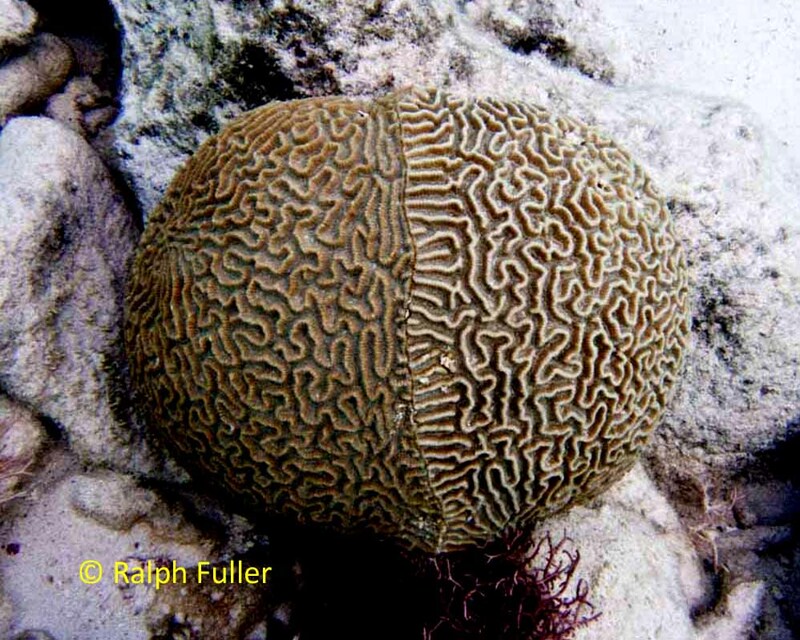 Not all stony coral polyps build reefs (see In Praise of Orange-Cup Corals post for an example). More than 500 species of reef-builders (“hermatypics,” as opposed to “ahermatypics”) have been identified in the Indo-Pacific regions, 62 in the Atlantic-Caribbean regions. Hermatypics have an advantage in zooxanthellae – forms of algae called dinoflagellates that live within their bodies in mutually beneficial relationships. Zooxanthellae essentially live independently of the polyp hosts, occupying small spaces in their membranes. A reference for growth rates: The brain coral stands on this mooring block, in about 15 feet of water at Bonaire, were some 12 inches across and 14 years old when the shot was taken. Like other algae, zooxanthellae use the process of photosynthesis to convert sunlight to food. By inhabiting the polyp’s, they find a protected home. By harboring zoox, the polyps get a large share of zoox food production. Reef-building corals may use their tentacles to troll for food, but they draw 80 percent of their nutrition from their zooxanthellae. The zooxanthellae’s process of photosynthesis provides the polyps with the glucose, glycerol and other organic compounds to produce the proteins, fats, carbohydrates – and calcium carbonate – that enables them to thrive and to build reefs. Giant clams, found in the Pacific are giant for the same reason. Zooxanthellae inhabit their tissues and they benefit from the nutritional supply. 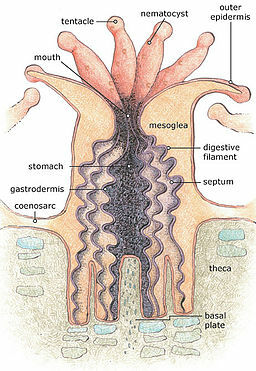 Also worth mentioning: Each polyp is connected to the polyps on each side of it by coenosarcs, gastrovascular canals that enable nutrient sharing. INTRODUCING: THE ALGAL REEF. OR PERHAPS NOT. It’s the myriad of zooxanthellae species, in all their differing colors, that give reef-building corals (and giant clams) their beautiful colors. There are marine biologists – algae specialists, presumably – who believe the role of algae in helping reefs grow and cementing them together (another topic, for later) is so strong that they should be called not coral reefs but algal reefs, or at least biotic reefs. Justifiably or not, that appears unlikely to happen. The synchronized broadcast spawning of masses of corals on certain moonlit nights is justly famous as a spectacular event, but, almost paradoxically, 99.9 percent of the coral reefs we see are the result of a different, non-sexual form of reproduction. Still, the release of eggs and sperms into the current to produce new larval polyps is an essential step. The planktonic journeys of larvae is a topic in itself, as the currents sometime carry the new organisms long distances before they find the right place, and right conditions, to settle and metamorphosize into adulthood. Along with access to sunlight, temperature and other factors, the right place includes a suitable solid substrate to attach to. A coral colony begins with that one polyp anchoring itself on a solid surface of old coral, actual rock, shipwreck, cement block. After that, the first polyp kicks off a cascade of asexual budding to create a coral head of genetically identical polyps, sometimes with thousands of members. All the corals of a coral head not only are of the same species, they’re all identical clones of each other. Year after year, they increase their numbers and their height. Left in peace for extended periods, some become quite substantial. Try to find out how long a coral polyp actually lives and some smartypants inevitably answers that since they keep cloning themselves, the answer is forever (unless, I add, they all die due to some other factor, like predation by parrotfishes. In any event, I still don’t know how long an individual coral polyp actually lives). So the upshot is that a single coral polyp creates a neat, ordered colony of itself. Unless a fish eats some of it, creates a dead spot and another, different coral lands there and starts its own colony. In diagrams and explanations, coral formation looks easy and tidy. In reality, it’s a mess. Reef-building corals need access to solar energy, and they have no compunction about growing against each other, over each other and on top of each other to get it. Some corals have “sweeper tentacles” that they can extend to their neighbors and sting them out of existence. 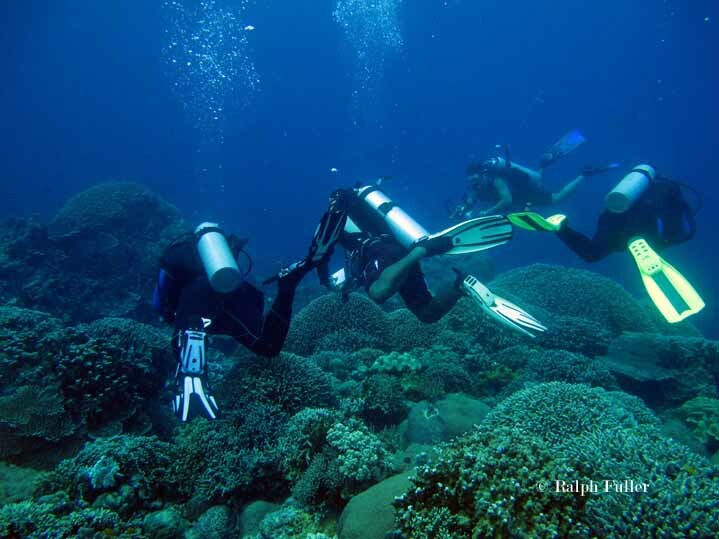 Staghorn corals grow rapidly and provide shelter for fishes. Elkhorn coral is another rapidly growing coral. Plate coral expands laterally in order to maximize exposure to solar energy. Finger coral, this sample from the Great barrier Reef. Pillar coral, polyps generally always extended. Table coral maximizes access to sunlight. CORAL GROWTH RATES The fastest growing are branching corals, such as elkhorn and staghorn corals; they can grow as much as four inches a year. Massive corals (e.g. : mountainous star corals) grow slowly, often less than an inch a year. A conundrum is that branching corals – particularly elkhorn – may outgrow their tensile strength, creating top-heavy branches that are vulnerable to breaking off if stressed by wave action or other disruption. Conversely, boulder-shaped massive corals just sit there year-after-year, smugly expanding by their one-inch-a-year without anything breaking off. Actually, how fast any of them grow depends on many factors, including species type, species type of their zooxanthellae, depth and amount of solar energy received, clarity of the water, current strength, perhaps, and temperature. On sunny days, some corals may grow twice as fast as on cloudy days. Corals are extremely fragile organisms and beautiful gifts. Look at them, don’t touch them. For one thing, Touching them, leaning on them, standing on them, sitting on them (I’ve seen it happen) or generally brushing against them can easily damage them – the coral may look the same to you afterwards, but inside the polyps you’ve placed pressure on may well have been sliced up by their own corallites. For another, coral polyps produce a mucus that lets them clean themselves of sediment. Brushing against them can rub this off, and impair their health. Increasingly, coral reef systems are being stressed, and the results are showing. The most notable problem is coral bleaching, which can occur if the water column warms significantly (or cools significantly, for that matter) and the zooxanthellae within the polyps are expelled. Since they take their pigmentation with them, the coral skeleton is left a stark white, or “bleached.” Without them, the coral polyps food supply is severely diminished. If the coral survives the problem, zooxanthellae may return over a period of weeks, although not necessarily the same species. It’s no secret that coral reef systems face difficult futures. In addition to the hazards of sloppy divers (see “Don’t Touch the Coral!” above) and destructive fishing practices, there are long-term global issues like atmospheric warming and the atmospheric buildup of carbon dioxide (The oceans have absorbed a great deal of man-made atmospheric carbon dioxide, but it’s turning them acidic, bad for corals and other animals under the sea). (See the post “Threats to Coral Reefs Greater Than Ever). PRINCIPAL SOURCES: National Oceanographic and Atmospheric Administration; Life and Death of Coral Reefs, Charles Birkeland, Editor; Marine Biology, by Peter Caruso and Michael Huber; Touch the Sea website, Dee Scarr’s Always Be Careful campaign; Coral Reef Alliance; Other Sources.